Craftin' Caro: Team Contest winner and up to 50% off the new Occasions Mini Catalogue Stamps? Team Contest winner and up to 50% off the new Occasions Mini Catalogue Stamps? One of the things I love most about having such a great team of demonstrators is when I throw a contest/ challenge at them... and they respond with such enthusiasm! Well, last week I launched a new contest for everyone on my team with the draw prize being a new stamp set from the upcoming Occasions Mini catalogue (see the pretty card I made with it???). This morning we did a random draw from all the participants to see who would win my copy of "Garden from the Heart" and the lucky winner is: KAREN DRUMMOND! Congrats Karen, and thanks to all the other gals who played along with this challenge! Now, did you know that as a new demonstrator on my team, *you* can pre-order all the new goodies this month by placing a hostess order for yourself and receiving an extra 20% off the stamp set prices, and THEN another 30% off the total? HOW STINKIN' COOL IS THAT?!?!? I finalized my pre-order yesterday and so the Man in Brown will be delivering to me some of our new stamps, buttons/brads, Designer papers, ribbons, Big Shot Embossing Folder and Embosslits. If you have questions about becoming a demonstrator and want to learn more about the perks & advantages, please click HERE. If you are all ready to join my team, click HERE -- just enter my password of canada and choose the items in your personalized starter kit. The first 2 people who join my team this month will receive this exclusive Level 2 Hostess set: Christmas Punch! 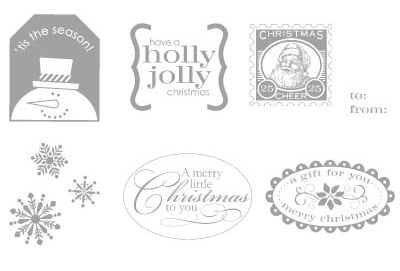 These images coordinate perfectly several of our fabulous punches, making Christmas cards, gift tags, and scrapbook page embellishments unbelievably easy. Knock out some holiday stress with the Christmas Punch set and enjoy the season! "Canadians, INK!" gals, don't forget to RSVP for our big Holiday Party on Saturday December 12 at 6:30. I have some fabulous things planned for that night, and I don't want you to miss out! I finalized my pre-order, too. That extra 20% was AWESOME!